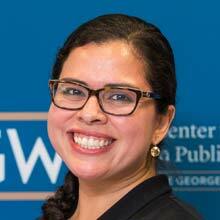 Gilda Cornejo is the Operations Manager at The George Washington University, Center for Excellence in Public Leadership. Her current work at the Center includes assisting the Associate Director of The George Washington University Center for Excellence in Public Leadership and the Director for Strategic Marketing and Business Development in coordinating and executing contractual responsibilities for the Operations Management Course. Gilda graduated from the University of Texas at San Antonio with a B.S. in Health. Prior to Gilda joining the center she worked as a Program Analyst for the U.S. Department of Veterans Affairs in the office of Veteran Employment Services Office. She volunteers her time in various organizations, one being the Hispanic Association of Colleges and Universities (HACU) Alumni Association where she serves in an elected role, Vice-Chair for Community Affairs. She is fluent in English and Spanish.